You don’t need to be a permanent resident of lowsec to enjoy its many pleasures. It can be a welcome break from your regular EVE life – a chance to step off the treadmill and enjoy something fresh and different. Just tell your corp you’re taking a vacation, grab some buddies and head over. 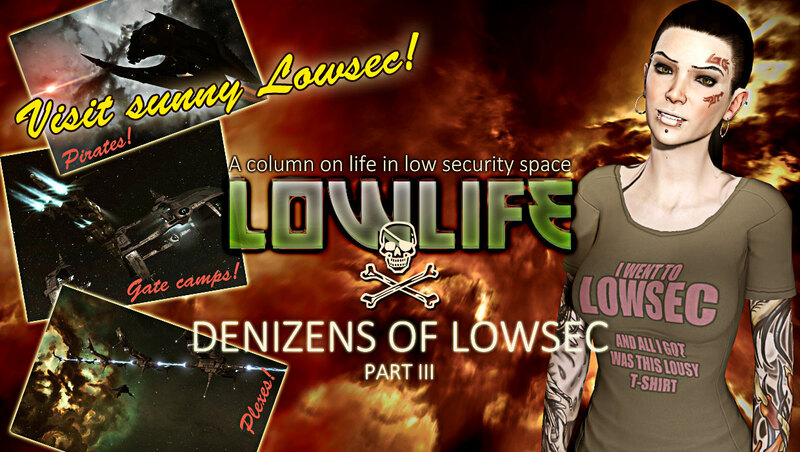 Many null and highsec pilots regularly visit lowsec to forget their woes and have some fun for a while. The ships flown in lowsec are usually cruisers and smaller. Generally speaking, the bigger the ship you bring, the longer it will take you to find a good fight. If you barge in with a 20 man battleship fleet sporting logistics support, most things will run from you and you’ll be locked out of all but the (rare) large Faction Warfare plexes. If you want that kind of skirmish you need to be familiar with the area and the entities willing and able to form up and fight you within a reasonable timeframe. The gamut of small gang warfare is where lowsec really shines. If you want action as soon as possible, your best bet is to bring a relatively small fleet (6-12) of frigates and destroyers. Unless you’re planning bling baiting make sure all the ships are roughly of the same value and size. An Astero or Dramiel in a fleet of Atrons will get primaried fast, and it takes a very skilled small gang veteran to be able to use that sort of thing as an advantage. Overall you’re best served by keeping the cost of your ships relatively low and making sure you have several spares to reship into. As a rule of thumb; the less experienced you are with small gang warfare, lowsec and fast paced PvP, the less valuable your ships should be. Cheaper ships also relieve a lot of pressure on pilots and FCs and make for a more laid-back and fun experience. If you’ve got the time and the means you might also consider bringing in a jump freighter loaded with ships and parking them in lowsec for quick reshipping. Often gangs will reship and go several rounds with each other. Keeping the other side waiting for too long may mean losing that opportunity. Once your fleet is assembled, it’s time to find a couple of points of interest for your roam. Faction Warfare lowsec is where it’s at so don’t bother going anywhere but the war zones. What you’re looking for is pirate and militia home systems and the pipes that tie them together. Ask around in your corp, alliance, and in channels where you think people with a knowledge of the area may hang out. With any luck you’ll be able to get the location of some key systems. Take a look at killboards for alliances known to be active in the area, you’ll soon see a pattern of activity. Work out the rest using your map; players in system, ships destroyed, jumps made. Identify gate camps by looking at pods destroyed. You do yourself a great service by employing a scout that can go +1 for you, especially since this is not your home turf. Have the scout report what’s in local and try and scan down open FW plexes and nearby gates. If you’re a highsec pilot make sure to choose your entry point into lowsec wisely. Entry systems on a direct route between militia home systems and the closest trade hub are often gate camped by individuals that are very skilled at what they do. One thing that’s great about lowsec is that almost everyone there is looking for a fight. You’ll have a smorgasbord of opponents to choose from. With a bit of skill you should have no problem finding a fleet worth fighting. Your prey of choice when in lowsec will probably be outlaws since they can be engaged at gates and outside stations without sentry gun interference. It is amongst this group that we also find the most bounty for collecting. Make sure to exploit militia fleets with outlaws in them (often called privateers, see last weeks column for a detailed description). For example; if your fleet is sitting on a gate and a mixed fleet of outlaws and neutrals lands in your lap, you can engage the outlaws first. If their fleetmates are to help them, they will do so under sentry gun fire. To perform efficiently in a FW warzone you must comprehend the nature of the battlefield. Understanding the laws in play often means the difference between victory and shameful defeat. Many fights in lowsec play out around Faction Warfare plexes. Running them down is the most fundamental mechanic in FW and the groundwork for system control. A basic understanding of how they work will go a long way to helping you win confrontations – especially since most of the targets you’ll be fighting are intimately familiar with them. Faction Warfare plexes are unique in that depending on their type they only let in ships of a certain size or smaller. Make it a habit to scan down FW plexes in a system as you enter it. If they are out of range, warp to a celestial closer to it. Often you will find that they are populated by people willing to fight. Militia pilots run the timers in plexes and fight each other over them. Pirates and other temporary visitors such as yourselves are drawn to the potential conflict in or around them. Just because a certain ship can’t fit inside a plex doesn’t mean that ship won’t sit on the gate and attempt to grab you as you land. A very common mistake amongst those new to FW space is warping to plexes at 0. This sometimes means you get caught on the gate itself and must spend precious seconds untangling yourself before you can activate the gate. What to do instead is warp to the plex at 10 km and spam the ‘activate gate’ button as you land. With a frigate or a destroyer this means you can ‘slide in’ even though hostile ships are trying to lock and tackle you. You can also sit inside plexes and let fights come to you. Once inside a plex you’ll want to make good use of directional scanners. Have at least one member of the fleet checking short scan at 10,000,000 to 100,000,000 km to give an indication what is on, or incoming to, the gate of the plex. 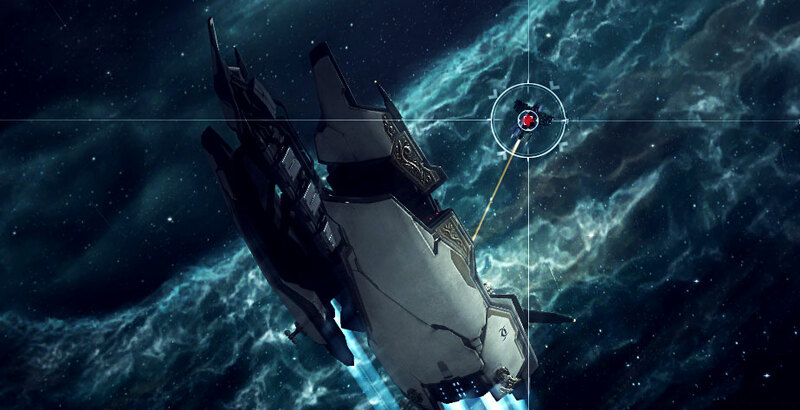 Have someone else checking long scan at maximum range, giving you early warning of potential enemy locations and fleet compositions. The main thing to consider is that whoever sets up inside a plex first has the advantage of dictating initial range. All ships coming into a plex do so close to the beacon, meaning the fleet in position first can can apply tackle. This is especially important if the opposing force has fast, kiting ships. The downside of this is that the enemy has ample time to decide if they want the fight and/or call reinforcements. If your enemy is reluctant to come in there is the option to ‘bounce’ out. Find the closest celestial, warp to it and then return to the plex gate. With any luck, there will be time to grab tackle and engage. In conclusion, I recommend everyone to at least spend a little time partaking in all that lowsec has to offer. Sometimes all it takes to spice up your EVE life is to try something different for a couple of days. Lowsec is wonderfully undemanding in comparison to null, and infinitely more action-packed than highsec. It may just be the adrenaline ride the doctor ordered.